The cost associated with produce waste in the cold supply chain is enormous – $35 billion annually is a commonly cited number. Often those losses are underwritten by insurance carriers. To help reduce this waste, Intelleflex has partnered with the The Hartford Financial Services Group (through its Hartford Ventures division). The Hartford’s vision is one of finding ways to help their customers to reduce loss before it happens. Not only does this save money, it saves time, paperwork and, ultimately, improves post harvest yield and revenues for growers, packers, distributors and retailers. 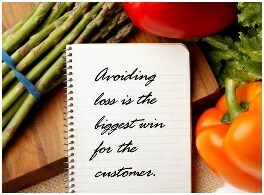 Avoiding loss is the biggest win for the customer. The Hartford has consistently been a leader in providing customers with loss control and risk reduction services. 93% of clients say The Hartford’s Loss Control services make a difference in their business. For years people have been trying to eliminate all of the challenges associated with temperature control in the cold chain. With Intelleflex, growers, packers and shippers can capture and utilize actionable data about the remaining shelf life of their products as they move through the supply chain. They can then optimize the distribution of products based on an individual pallet’s remaining shelf life expectancy, determined by pallet level condition monitoring. For example, if an individual pallet is determined to have only 8 days of shelf life remaining, it can be immediately routed to a nearby destination and a pallet with 12 days of shelf life can be sent to a further destination. In that way, all of the product is still salable when it reaches the retailer. The data captured by the Intelleflex temperature monitoring solution also enables The Hartford to innovate within the marine insurance market, which includes ground, air and sea transportation. Working with its customers, The Hartford can use the information gleaned to gain a deeper understanding of the cold supply chain, which may result in opportunities to tailor offerings or underwrite policies based on data trends. It’s exciting when two companies share a vision that can provide widespread benefits to their customers. You can read more about this partnership on the corporate alliances page on our website. This entry was posted in Perishables, RFID News, RFID Tags. Bookmark the permalink.